Kings River Life Magazine celebrated its 8th anniversary on May 29 of this year and what a journey it has been! We have expanded above and beyond what I ever would have imagined as far as what we cover, and the fact that our readership now is all over the world. In the beginning it was only local articles, but that changed quickly. Now half of each issue is filled with mystery fun-book reviews and giveaways, mystery short stories, TV reviews, author interviews and more! We also cover animal rescues, theatre, food, travel and more. You can still find us at http://KingsRiverLife.com, but we have also added a brand new blog, KRL News & Reviews at http://www.krlnews.com/. 2018 brings something brand new to Kings River Life -- a mystery podcast! 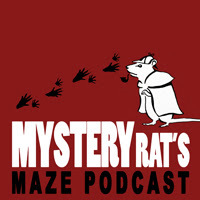 The podcast, entitled Mysteryrat's Maze Mystery Podcast (after the name of our mystery section) will post its first episode on June 5! It features a mystery short story written by mystery author Nancy Cole Silverman. Each will be read by local actors from the Fresno area where we are based. We will be posting at least one episode a month featuring mystery short stories, and some mystery novel first chapters! Already lined up are short stories by Dennis Palumbo, Joan Leotta, Lesley A. Diehl, and Neil Plakcy. Some of the authors who have sent us first chapters are Nancy West, Kathleen Kaska, and Jeri Westerson (we will have the first chapter from her brand new Crispin Guest book that comes out in August). I first got the idea to start a podcast early in 2017, but even now it is still growing and evolving. It has taken a lot of work and planning but I am very excited about this new adventure and I hope all our listeners will be too! Podcasts have become very popular and they are a great new thing to listen to on your commute, or just on your phone or computer at home. My hope is to provide a combination of an audio book feel, with almost more of an old mystery drama feel as the actors do act out the stories. My ultimate goal is to possibly produce a full on mystery drama in another year or two with a group of actors, sounds effects and all. For the writers out there interested in submitting a short story or chapter for consideration-right now we are mostly looking for around 2000 words but that may continue to change so don't be afraid to ask if you have something shorter or longer. We are open to cozy and more traditional mysteries, and maybe a bit of noir as well. We are not interested in anything too graphic though as far as language and sexual content. You can send your submissions to krlmagazine@gmail[dot]com. Reprints are okay, and for chapters make certain you have the okay of your publisher. You can find our podcast at https://mysteryratsmaze.podbean.com/ and hopefully by now on iTunes (if you don't find it there yet keep checking). If you would like to sign up for our monthly podcast newsletter you can do so here: https://tinyletter.com/kingsriverlife. Our plan with the newsletter is to not only keep you up to date on each episode but we also hope to have some special contests only for our newsletter, an overview of what has gone up in KRL the past month, and possibly over time some extra content. So I hope you all join us on this new and exciting journey! And as our announcer says at the end of each podcast, we wish you a life full of mystery! Sounds like an excellent idea! Good luck with the podcasts.